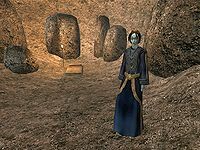 Find Mehra Milo in Vivec. Return to Caius in Balmora to receive your last orders from him. 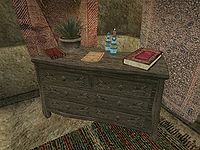 Travel to Vivec and look for Mehra Milo in the Library of Vivec and her quarters. Visit the Ministry of Truth and have the guard Alvela Saram let you in. Find the prison cells and Milo, giving her a Scroll of Divine Intervention for her escape. Travel to Holamayan to meet up with Mehra Milo and the Dissident Priests. Talk with Gilvas Barelo in Holamayan to receive the lost prophecies. Return to Caius Cosades in Balmora after being cured of Corprus over in Tel Fyr. Once again you are promoted, this time to Operative. 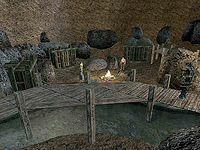 Caius informs you that, for various reasons, he is being recalled to the Imperial City, which actually makes you head of the Blades in Vvardenfell. Talk to Caius about your new promotion to get some handy items as well as use of his house. His last orders to you before he leaves are to continue to investigate the lost prophecies, and to bring them to Nibani Maesa in the Urshilaku Camp once you find them. 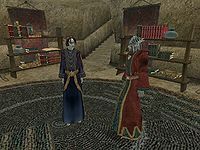 The first step is to meet Mehra Milo again in the Hall of Wisdom in Vivec's Temple Canton, and tell her what you have learned from the Urshilaku. Milo was being watched and left a message in her private quarters under the code word AMAYA. Get to the Hall of Wisdom in Vivec to look for Milo. If you search the library, you will discover that she is no longer there. Ask the other librarians about her and they will tell you that her private quarters are opposite the Canon Offices in the Hall of Wisdom. Her quarters are locked (level 20) but by this point you should have spells, scrolls or picks to gain entry. The key can even be found behind a drape near the door. Milo is not in, but there is a Note to Amaya on the dresser. The note says that Milo is visiting the Inquisitor at the Ministry of Truth and that you should bring two Divine Intervention scrolls. She goes on to mention that the guard, Alvela Saram will let you past if you mention you are looking for her and that she has left two levitation potions for you to use. Clearly, Milo has been imprisoned by the Ordinators and has left this coded message in the hope that you would find it. 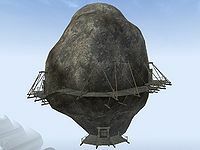 The Ministry of Truth is the large meteor floating over the Temple Canton, which can only be reached using levitation. You can use a levitation potion or spell, or instead you can make an offering to the Shrine to Stop the Moon, located below the ministry. You will need to donate a potion of rising force (a bargain, cheap, standard, quality, or exclusive potion will work, but not a custom potion). In exchange for your donation, you are blessed with a powerful levitation spell (100 points for 1440 seconds). Make sure you remember the two Divine Intervention scrolls. You can buy them from Janand Maulinie in the Mages Guild in the Foreign Quarter. Outside the top entrance to the ministry you will find the guard Alvela Saram. Talking with Alvela reveals that Milo is a prisoner and you are tasked with breaking her out. She gives you the main key and suggests to enter using the back door. Keys to open other doors inside must be found. Once inside the Ministry, do not let anyone see you as they will attack and call the guards. The guards here are well armored and hit hard, so unless you're prepared, a stealthy approach may be best (any form of invisibility or chameleon helps). The Prison Keep is at the top of the Ministry and has only a level 20 lock guarding it. The Ministry of Truth Sector Key unlocks this door and is to the right of the upper entrance in the Grand Inquisitor's desk. Once you enter the Keep, you may be attacked by a few guards, so be careful. Mehra is in the right-most holding cell waiting for you. Overall, there's technically no wrong way to do this, get to Mehra however you can. If you are backed into a corner and forced to fight, don't worry: you will not incur a bounty for killing any of the Ordinators. If you have a Temple rank of less than level 5 (Adept), or are not a Temple member at all, your disposition with the Inquisitor is at least 70 (this can be achieved with a charm spell, if necessary), and you are not of a beast race, you can bluff your way past the Grand Inquisitor and the other guards by donning an Indoril helmet, cuirass, and pauldrons, and then talking to the Grand Inquisitor and telling him that you have "proper authorization". He will give you his key and the guards will refuse to attack you. Alternatively, if you are at least Adept rank in the Temple, or have a disposition of 100 with the guards prior to speaking to them the guards will not attack you unless you talk to them twice (they give you a "leave or die" warning the first time) or enter the prison area. Be warned, however, that once any guard attacks you, whatever the reason, all ministry guards in the area will then attack you on sight, and once this happens, they will behave like enemies, not normal guards, that is, they will forever try to kill you unless you kill them, or temporarily stop the fight with a calm spell (and even then, they will refuse to speak to you normally). Also note that if you have the Morrowind Patch Project installed, and you are Patriarch of the Temple, most of the guards in the Ministry will not only allow you to pass, but if spoken to, will give you helpful advice regarding the acquisition of keys and avoidance of potential hostiles. They will, however, protest the irregularity of your demands for access to the Ministry. Once you find Mehra, she outlines the escape plan. You are to give her one Divine Intervention scroll for her to make her escape, and you escape the same way or another, as you like. You are to meet each other at the secret Dissident Priests Monastery of Holamayan. You are to meet a woman on the east docks of Ebonheart (just southwest of Vivec) named Blatta Hateria. Tell Blatta that Mehra sent you and that you want to go fishing. Blatta will then bring you to Holamayan where you and Milo will meet up. Once there, you'll receive the lost prophecies from the Dissident Priests' leader Gilvas Barelo. Additionally, the entrance to Holamayan is concealed with magic. Speak to Vevrana Aryon, a monk on the dock at Holamayan about it. You can leave the Ministry however you wish, although teleporting out via Recall or intervention is obviously the easiest way. If you use a Divine Intervention scroll as suggested, you'll end up in the middle of Ebonheart, which is rather convenient. Blatta is on the left side of the docks, and will ask if she knows you. Once you mention you want to go fishing, the option to travel to Holamayan will be added to her destination list (labeled as Azura's Coast Region). You will have to pay her for the trip. Vevrana is on the docks across from you when you arrive, and she will tell you that the magical shield guarding Holamayan opens only at dusk and dawn, meaning you will probably have to rest until the proper time. She also can arrange your trip back to Vivec when you choose. Dusk and dawn times are 6pm to 8pm and 6am to 8am, respectively. You are able to rest on the grass outside the entrance, instead of waiting. You can find Mehra with Gilvas Barelo just off to the right in the library when you enter Holamayan. Gilvas has some information on Dagoth Ur, among other things, as well as the lost prophecies that you have been looking for. You receive three notes from him relating to the prophecies: The Lost Prophecy, The Seven Curses and Kagrenac's Tools. Talking to him about Nerevar also nets you three more books. Make sure you exhaust all dialogue possibilities with Gilvas to get all the information that you can. By all accounts, you are becoming closer and closer to being the true Nerevarine. Now that Caius is gone, you have no one to report to, but don't forget that Nibani Maesa in the Urshilaku Camp wanted to speak with you again once you've found the lost prophecies. Once Caius Cosades gives you this quest and you leave his house, he disappears, so if you want training from him, make sure to do it before leaving. You get the first 20 disposition increase with Mehra Milo when you receive the quest, and the other 40 when you hand her the scroll. Milo's Quarters key might not appear and you have to open the door with a lockpick or a spell. Mehra Milo may not be found in the library of the Holamayan Monastery after rescuing her, most likely as a result of having fallen under the map. 10 I found a note addressed to 'Amaya' in Mehra Milo's room. I think it means she's in trouble, probably imprisoned in the Ministry of Truth. I'm to tell the guard at the entrance, Alvela Saram, that I'm looking for Mehra Milo, and she'll let me in. Milo wants me to bring her two Divine Intervention scrolls. For an escape plan? She also left me two Levitation potions. 15 Alvela Saram gave me a key to the entrance to the Ministry of Truth. I'll need keys for other doors inside; look for them in desks. She said there's sympathy for the Dissident priests among the Ordinators, but if anyone gets killed getting her out, we'll lose that sympathy. 20 I gave Mehra Milo a Divine Intervention scroll. She'll meet me at Holamayan, a Dissident priest monastery, and we'll get the lost prophecies. I'll go to the East Docks in Ebonheart, find Blatta Hateria, tell her that Mehra Milo sent me, and that I want to 'go fishing.' She'll bring me to Holamayan by boat. I must speak to Vevrana Aryon, a monk at the dock at Holamayan, about Holamayan's magically hidden entrance. 22 Vevrana Aryon, a monk of Holamayan, says I will find Mehra Milo in the monastery here, on this island. A stone pathway north from the docks leads uphill to the entrance to Holamayan, but the portal opens only at dusk and dawn, the magical twilight hours sacred to Azura. I will find Mehra Milo in the library with Master Barelo. Later, Vevrana Aryon can arrange for my return to Vivec whenever I am ready. 25 Here's Gilvas Barelo's short interpretation of 'The Lost Prophecy'. 'An outlander -- foreign-born, but welcomed as a guest -- confronts seven curses beneath Red Mountain. His hand, blessed by Azura, uses a cursed blade to bring justice to House Dagoth, or House Dwemer, or both.' Maybe the prophecy was lost because Ashlanders didn't like the idea of an outlander Nerevarine. 40 Gilvas Barelo says that Dagoth Ur grows stronger while the Tribunal grows weaker. He sees the return of Saint Nerevar, even if it is only the 'spirit' of Saint Nerevar, as the best hope for salvation from Dagoth Ur's menace. 42 The Temple might not be so intolerant of differences in opinion, Gilvas Barelo says, but the Ordinators under Berel Sala claim that the threat from Red Mountain and Dagoth Ur can only be resisted with a unified, resolute faith. If the Dissident priests could show they can confront Dagoth Ur more effectively than the Ordinators, the Temple and people might support the Dissident priests. 44 Gilvas Barelo says that faith in the Temple's protective power was strong as long as the Ordinators, Buoyant Armigers, and Tribunal could contain the blight and Dagoth Ur's creatures within the Ghostfence. But now travelers and settlements suffer from blight storms and marauding monsters, and the people fear the Temple is losing its ages-old battle with the Devil Dagoth Ur. 46 The appearance of the Sixth House is clearly a sign of a coming crisis, according to Gilvas Barelo. In such troubled times, the Dunmer may turn to the ancient pillars of faith, the ancestors and the Daedra, and the prophetic visions granted by Lord Azura. Then they may look to the Nerevarine, Saint Nerevar Reborn, to lead them against the grim armies of Dagoth Ur. 48 The Heirographa are the collected priestly writings of the Temple. The Apographa are the 'hidden writings' -- secrets known only at the highest levels of priesthood and inquisition. The Dissident priests have gathered much of the Apographa in Holamayan. One of the chief disputes between the Temple and the Dissident priests is that the Temple hides the truth from its followers. 49 From the Apographa, Gilvas Barelo gave me a document called 'Kagrenac's Tools'. This document describes the terrible secret that the Temple conceals about the true history of the Tribunal and the corrupt nature of their divine powers. To hide this secret, the Temple persecutes the Nerevarine and the Dissident Priests. Barelo says the persecution must stop, and we must unite against the true enemy, Dagoth Ur. 50 Finishes quest Gilvas Barelo gave me 'The Lost Prophecy' and 'The Seven Curses'. 'The Lost Prophecy' says the Nerevarine is an outlander. That may surprise the Ashlanders, but it suggest that I might really be the Nerevarine. He also gave me a document based on the Apographa called 'Kagrenac's Tools' which reveals the guilty secret behind the Tribunal's divine powers. I must bring these lost prophecies to Nibani Maesa as soon as I can. 1 Finishes quest Blatta Hateria is ready to take me to Holamayan any time I'm ready to travel. And she'll offer that service any time I need it. 5 Finishes quest Caius gave me some gold and a few things that 'might come in handy.' And I can use his house while he's gone. 1 Finishes quest Gilvas Barelo gave me several books about Nerevar. 100 Finishes quest I spoke to the officer in charge in the Ministry of Truth Prison Keep, and I believe he is going to let me proceed without interference. This page was last modified on 30 July 2018, at 05:00.